Goodman Masson are recruiting with one UK’s leading insurers who have a presence globally. They are looking for a part-nearly qualified actuary who is interested in working within their Commercial Lines Reserving team. This is an exciting role providing Reserving support to their Commercial Lines business. Though your role will focus on reserving and solvency II, there will also be opportunities to get exposure to capital modelling and pricing. 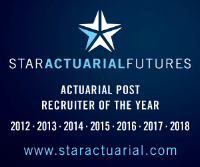 The ideal candidate will have had at least 18 months of GI Actuarial experience ideally within reserving. Having a good understanding of some actuarial software e.g. ResQ will be a bonus. They would also like to see you making good progress with your actuarial examinations.